Minute of Silence at the 2012 London Olympics. and a service for the Israelis will be held each Olympics going forward. You made this happen! The collective power of your signatures pressured the IOC to reckon with their intransigence in honoring these Israeli athletes, who came to the Olympics to compete and left in coffins. The surviving family members, including Ankie Spitzer and Ilana Romano, widows who have been lobbying for the IOC to do the right thing for more than four decades, are very pleased with the way their loved ones were honored. While it wasn’t the minute of silence at the opening ceremony, they consider it a victory. Thank you for your support, and thank you change.org for propelling this cause. It just shows how powerful we can all be when we speak as one for a cause that is just. 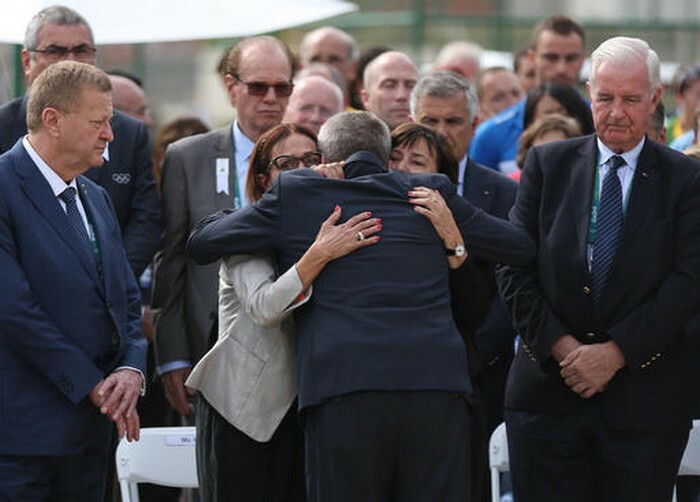 RIO DE JANEIRO - International Olympic Committee President Thomas Bach led a mourning ceremony Wednesday for the 11 Israeli athletes and coaches slain by Palestinian terrorists at the 1972 Munich Olympics - a tribute that a widow of one of the victims said brought "closure" for the families. Jacques Rogge: Minute of Silence at the 2012 London Olympics.